Allen Witbeck, Michael Saldivar, and Phil Helfer lead worship at the Southwest Focus Retreat for Grace Brethren ministry leaders. 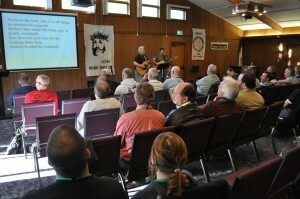 It is being held through Wednesday at the Oaks Conference Center near Lake Hughes, Calif. The annual Southwest Focus Retreat for Grace Brethren ministry leaders began this afternoon (Monday, January 31) at The Oaks Conference Center near Lake Hughes, Calif.
Pastor Dan Allen (Grace Brethren Church, Ashland, Ohio) is leading the 48-hours away. He began with the equation R+R+R=Transformation, Revelation + Relationship + Retreat = Transformation. Focused on the theme, Fully Alive, th looked at Ephesians 3:16-19. “Treat this as a dine-in rather than a drive-through,” he told the group, some who have come from as far away as Hawaii and Manitoba, Canada.